Philips Entertainment has started an LED revolution with the Showline family of LED luminaires that are currently in-stock and ready for action worldwide. A complete range of LED luminaires, Showline is designed specifically for the entertainment industry using high-performance LED sources combined with rugged construction, and all Showline luminaires are designed to work seamlessly together to match colour, dimming, and operation for a broad spectrum of productions including concert touring, theatre, television, motion pictures, and corporate events. At the heart of all Showline products is the Harmonize Color Calibration technology which is a proprietary, advanced LED colour matching system, consisting of three correction modules: RGB, RGBW and Cool White/Warm White. Every Showline fixture undergoes rigorous testing to provide consistent color control between all pixels and luminaires, as well as output of the highest quality. Backed by the exceptional design standards of all Philips Entertainment products, Showline luminaires also feature built-in effects, an auto-orienting LCD menu, multiple dimming curves and color modes, full RDM implementation, as well as a unique strobe control paradigm. In addition, Showline fixtures utilise industry standard Powercon in/out and 5-pin DMX connectors, and are tested to CE, CCC and, where appropriate, ETL standards. Already having tremendous success on concert tours such as The Smashing Pumpkins and Train, as well as such productions as the Latin Grammy Awards and at the Lincoln Center in New York City, the SL BAR 640 and SL BAR 660 are powerful 4-foot and 6-foot RGBW linear wash luminaires that deliver exceptional light output and endless creative possibilities. Whether used as a wash or as a direct-view linear bar, the homogenised output will add to any production. With independent module control of the pixels and simple batten connections, the SL BAR 640 and SL BAR 660 provide maximum flexibility and originality. The SL BAR 520 is a 2-foot RGBW linear wash luminaire that produces over 8000 lumens of output with six standard 8° lenses and high resolution pixel mapping control. A unique locking system allows for quick connecting of multiple stacked or side-by-side units while retaining perfect pixel pitch. 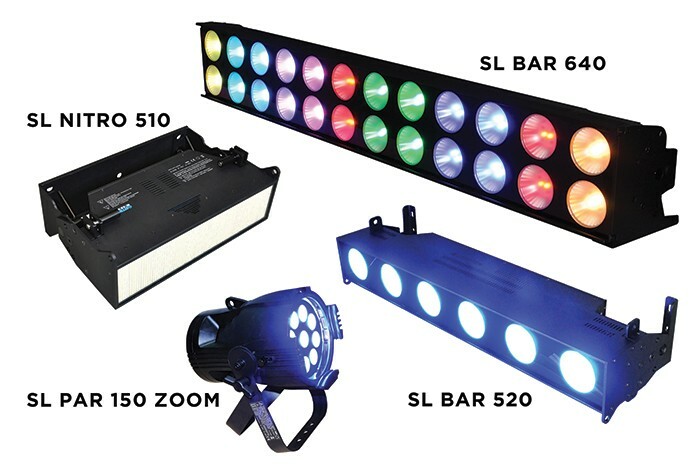 Plus using the quick-connect system, custom configurations can also quickly be created with the SL NITRO 510 LED Strobe to provide a multitude of creative looks. New to the market, and currently in-stock at rental companies such as Neg Earth in the United Kingdom, the exciting SL NITRO 510 is a revolutionary LED-based strobe luminaire that provides intense bursts of light and dynamic effects. The tightly packed array of over 1300 high power LEDs ensures maximum output and full-field, even distribution across 120°. Six unique zones of control allow ultimate flexibility while unique built in chases aid in creativity and simplicity. With over 68,000 lumens of output, continuous-on and continuous full strobe capabilities, the SL NITRO 510 rivals conventional strobe fixtures and retains dynamic looks whether washing a stage or pointing directly at the audience. Additionally, the quick-connect system allows SL NITRO 510 fixtures to easily connect together or with SL BAR 520 luminaires providing almost unlimited design possibilities. The SL PAR 150 ZOOM is an LED Par that utilises nine homogenised RGBW LEDs to produce over 3200 lumens of output with an adjustable beam angle range from 15°-70°. The luminaire includes a dual purpose yoke that can be used to hang the fixture or as a versatile floor stand. As a linear LED wash luminaire the SL STRIP 400 offers both RGBW and Tunable white models and accepts a range of standard beam spread accessories to adjust the 20° beam angle giving designers an essential tool for blasts of colour or slices of light. The SL BAND 300 has a native 10° beam angle and produces 2000 lumens of output also in either tunable white or full colour-mixing RGBW models. The SL WASH 180 is an automated LED wash luminaire which can be used in virtually any stage application to provide an intense output of light that gives designers the broadest spectrum of colour possibilities with a wide range of beam angle projections from 12°- 45°. Many installations have enjoyed the success of these products including Vivid Light Festival in Sydney, Australia, the Old Theatre in Skopje, Macedonia, and the Veles Theatre in Veles, Macedonia. The SL STRIP 400, SL BAND 300 and SL WASH 180 are only available outside of North America.